Drohne | The Goose Is Out! Drohne, aka Philip G Martin, first appeared at the Goose way back in 2008 at one of our very first Goose gigs at the EDT, when he supported Jackie Oates. He subsequently supported Brass Monkey at DHFC the following year, and then in 2013 supported John Kirkpatrick at our final concert at The Dog. Crikey, what a lot of venue changes we have had! Every time Phil has appeared at the Goose, he has had a very appreciative audience, with an interesting mix of instruments and an equally interesting mix of material (Drohne, not the audience!) 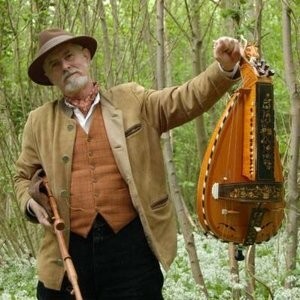 All Tomorrow’s Parties played on the hurdy gurdy, anyone? Sometimes Phil brings along other musicians, such as Simon on melodeon and Phil on wind instruments. Whoever it is, they’ve always been great! Phil makes and releases a unique modern music based on the use of hurdy-gurdy and bagpipes. His music incorporates medieval pieces, traditional songs, carefully selected modern songs, folk and sound pieces into a whole which is always varied, but coherent. STOP PRESS: We are very very sad to have to tell you that Phil died on 18 October 2014, after a long battle with heart problems. It was a privilege to have known him. Rest in peace, Phil.